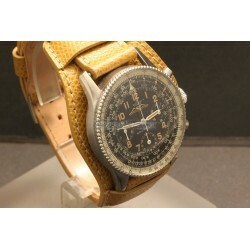 Breitling is a brand of Swiss watches produced by Breitling SA, a private company headquartered in Grenchen, Canton of Solothurn (originally founded in Saint-Imier, Bernese Jura by Léon Breitling in 1884).The watchmaker offers high-end Certified Chronometers designed primarily for aviation use. Breitling's watches offer aviation functions, though their chronograph functions have become more of status symbols than practically applied tools. 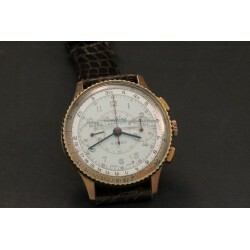 All Breitling watches are manufactured in Switzerland and are made from Swiss components. Raw movements are obtained from ETA and Valjoux and are modified in the Breitling Chronometrie Workshops, before undergoing COSC (Contrôle Officiel Suisse des Chronomètres) certification. As of 2009, Breitling now makes a manufacture movement, designed, manufactured and assembled completed in-house (B01 Calibre).NB WE REMIND YOU THAT A LOT OF OUR WATCHES ARE SOLD BY US FOR OUR CUSTOMERS...THIS MEANS THAT IF YOU WANT TO COME IN OUR SHOP TO SEE ONE OF THEM YOU HAVE TO CONTACT US TWO OR THREE DAYS BEFORE IN ORDER TO LET US TO HAVE THE TIME TO BRING THERE THE WATCH! 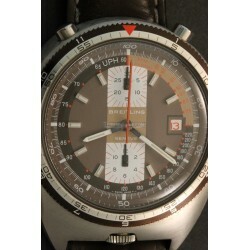 Breitling There are 12 products. -Titanium case ( diameter 40mm )-Quartz movement -Black leather strap-Original steel buckle-Grey dial-With calendar, alarm, chronometer and GMT-Sapphire glass-Reference E56059L-Made in 1992-Rare edition made for an acrobatic flight championship!-Very nice conditions-With its original box and papers! -Yellow gold/steel case ( diameter 40mm )-Automatic movement caliber 7750-Brown leather strap-Beautiful original blue dial-With date-With Chronograph-Sapphire glass-Reference 81950-Made in the '90s-Nice conditions! 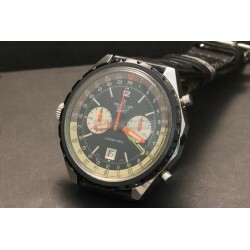 Steel case ( diameter 37,5mm ) Hand winding movement caliber 175 Brown leather strap Wonderful original dial With chronograph Plexi glass Reference 781 Made in the '50s Rare model that was given as a gift to the FIGC referee Very nice conditions! 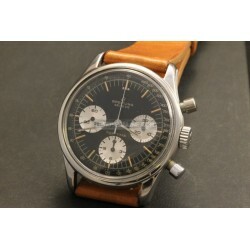 Steel case ( diameter 40mm ) Hand winding movement caliber 178 Brown leather strap Beautiful original black dial With chronograph Plexi glass Reference 806 Made in the '60s Rare model! Wonderful conditions! Steel case ( diameter 42mm ) Automatic movement caliber 12 Brown leather strap Brown dial With date With chronograph Plexi glass Reference 2117 Made in the '70s Rare model Wonderful conditions! 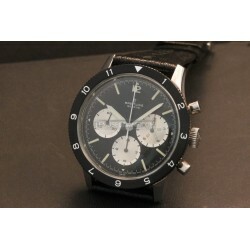 Steel case ( diameter 38,5mm ) Hand winding movement caliber 178 Brown crocodile strap Wonderful original black dial With chronograph Plexi glass Reference 810 Rare one piece case model Made in the '60s Very nice conditions! 18kt yellow gold case ( diameter 36mm ) Hand winding movement caliber 175 Argentee original dial With chronograph Plexi glass Reference 769 Made in the '40s Rare model Very nice conditions! 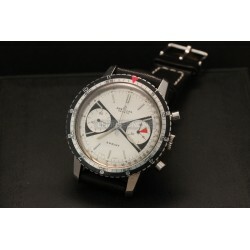 Steel case ( diameter 42,5mm ) Hand winding movement caliber 178 Black tropical strap Original steel buckle Beautiful original dial With chronograph Plexi glass Reference 7650 Made in 1969 Extremely rare model! Wonderful conditions! 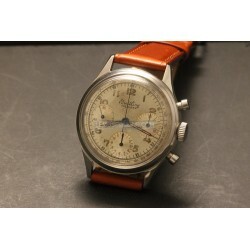 -Steel case ( diameter 40mm )-Hand winding movement caliber 178-Beautiful brown leather NATO style strap-Original steel buckle-Wonderful and rare original AOPA dial with patina!-With chronograph-Plexi glass-Reference 806-Made in the '50s-Rare model-Wonderful conditions! 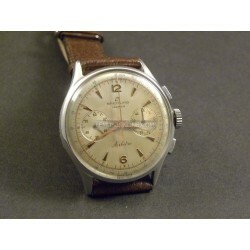 -Steel case ( diameter 36mm )-Hand winding movement caliber 178-Brown leather strap-Wonderful original dial with tritium indexes-With chronograph-Plexi glass-Reference 788-Made in the '50s-Rare model-Very nice conditions!